When you purchase a new condo (or even a resale unit), you want the most for your money, including the features and finishes that make your living space beautiful. The great news is that condos in Toronto today are packed with standard features that were considered upgrades years ago. When you look at what your purchase price includes, you will be pleasantly surprised with the quality of the builder’s standard finishes. Many condo buyers decide that extra upgrades aren’t necessary. Many of my international clients tell me that we have the best choices in North America right here in Toronto. If you do wish to upgrade, consider your choices wisely. Do your homework before your colour selection appointment, where you will decide on the items that transform you unit into your home. Focus on two key areas: Elements that will make your life more comfortable and those that will boost your resale value in the future. Take hardwood flooring for example. In some condos this comes standard. If not and you suffer from any kind of allergies, you may find choosing this as an upgrade is beneficial to your health. Hardwood is definitely a plus when selling a home, so electing to add it can serve a dual purpose. Hardwood comes in an amazing assortment of colours and textures. Add an area rug here and there, and you can change your look every few years with little financial outlay. Are you interested in the current “green” movement? If so, you may want to consider upgraded finishes that will leave a lessened carbon footprint on the environment. Think natural. If granite countertops are not standard in your kitchen, up may want to select them as an upgrade, or quartz or Caesarstone. Nothing beats the beauty and durability of natural stone. Another thing to keep in mind when selecting upgrades is to focus on kitchens and bathrooms, particularly if budget is limited. These rooms are extremely important to buyers, as I am sure they are to you. Options such as self-closing drawers, elaborate closet organizers, cabinetry with glass fronts, and even paneled appliances. Since many suites feature linear kitchens that are completely open to the living/dining area, the paneling makes the appliances look more like furniture and therefore a natural extension of this space. And when you think kitchens, think tall upper cabinets, under-counter valance lighting and useful gadgets like wine fridges. When it comes to the bathroom, people are really going for a spa look, so we are seeing more marble and sustainable stone flooring. There are many other possibilities such as cornice moulding, enhanced wiring, built-in shelving, bullnose edges on counters, extended islands and the like. It’s important to remember that in the future if there are two comparable suites up for resale, all other things being equal, buyers will usually choose the one with the better finishes. Before your colour selection appointment, do some research, and you may want to get some advice from an interior designer. 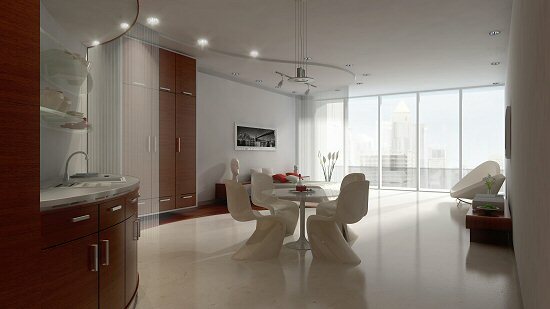 They are experienced in working with compact condominium spaces, and are familiar with the spectrum of styles. They know how to choose excellent combination palettes and finishes. There is also a design consultant that works for the builder to offer some guidance. The most important thing to consider when deciding on your selections is to choose what will make your suite feel like “home”.